Happy birthday in the Indian style! | Walk with us! Happy birthday in the Indian style! I woke up this morning at 5:30 am to give myself plenty of time to get ready for the short drive to Vempadu. We planned to leave at 7:00 am. My 73rd birthday was last Tuesday but since I was in Chennai at the time the Eluru community is celebrating it today. Actually for me it’s been an almost daily celebration starting in the novitiate at Nambur until today. It won’t stop here as I’ll have two more celebrations: one next Thursday with my SCJ community at Sacred Heart at Monastery Lake and then next Sunday with my family. 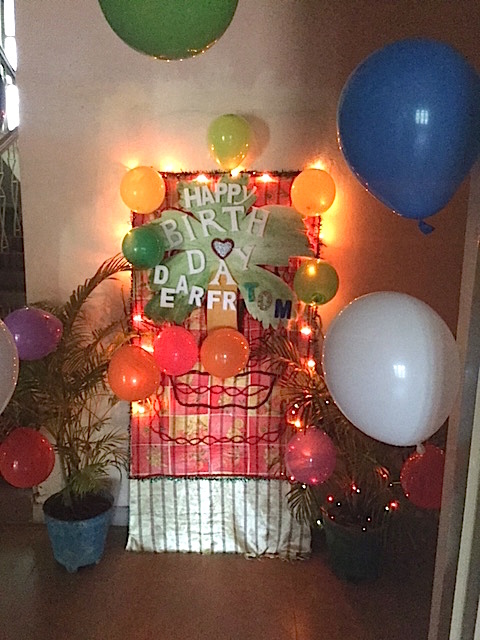 One of the local house traditions is to decorate the door of the person celebrating his birthday. That tradition was certainly kept this morning. When I opened my door around 6:00 am and with the house just getting up the bright blinking lights staring me in the face felt as though the sun was approaching its zenith! I’ve learned Indians love bright colors and bright lights, especially the kind that twinkle. I have no doubt there are more Christmas lights in India then anywhere in the world and that they are used not only at Christmas but for celebrations of all kinds the year round. Since this is Sunday and most of the brothers are off at one time or another to their ministry experience and there is no set time for breakfast the usual cake cutting and flower presenting and HEARTY BIRTHDAY greetings did not take place. That will be this evening instead. We’re going to have outdoor adoration at 6:30 pm followed by a program in my honor and supper. My dear friend Hari (Haresh) Kumar, scj, said I should be ready for two surprises. I have a pretty good idea of one. He asked for my sister’s (Marge Bray) email address as she had some pictures of me he requested (and got). Hari is good with the computer so I suspect something with these photos and the computer may pop up this evening — I’ll let you know tomorrow. Fr. Gopu and I did manage to leave at 7:00 am. It’s about a half hour drive to Sacred Heart Parish. I think it’s about 32 kilometers (19.8 miles). Normally some of the brothers would travel with us but they left at 6:30 am to drive into Eluru to pick up some sisters who help with the music and teach catechism after Mass. When the brothers were late in coming I should have guessed something was up. It turned out they not only had to pick up the sisters but a birthday cake large enough to feed the congregation. Fr. 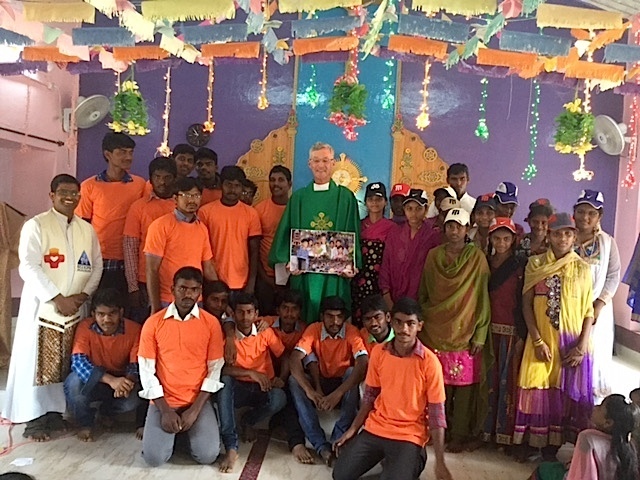 Jojappa Chinthapalli, scj, the pastor, had the Dehonian youth group participate in the Mass and at its end I presented them with t-shirts for the men and hats for the ladies. I wasn’t aware that I’d be given credit for the gifts but that’s what Fr. Jojappa said so I was asked to present them to each person who in turn wished me a happy birthday. I was presented with a collage photo put together by Deacon Suresh Gottom, scj. The Mass and post-liturgy presentations took about two hours. Fr. Gopu was the celebrant and Fr. Jojappa preached. Both of them and Deacon Suresh had to go to the parish substations for Masses. All along I thought there were two substations but it turns out there are three. The normal schedule is one substation has Mass at 6:30 am and the main church (Sacred Heart) at 7:45 am with the other two stations at 10:00 am. Now all of these are on Indian time with the start being an approximation as was the case today. Since we went long the two 10:00 am Masses started sometime after 10:00 am. Fr. Jojappa stayed after Mass to take me over to the construction site of the new community house. Our North Italian Province is providing the financial support for its construction. According to Fr. Jojappa, with luck the building will be done in about seven months. The community house is only about a five-minute walk from the church. It’s surrounded by rice paddies. They have raised the land by about six feet to ensure that it will remain dry in the rainy season. Finally I waited with for everyone to come back from the substations as Fr. Jojappa had prepared to serve ice cream and the last of my birthday cake for our brothers and the sisters. A nice touch to end my morning visit to the parish. We made it back to Eluru at about 12:40 pm and joined the rest of the community for lunch.